YouTube is absolutely one of the best video hosting platforms teachers and students can draw on to access, curate and share educational video content. It also provides a powerful video editing tool that allows you to create and annotate your videos the way you want and for free. In today's post, we are re-sharing this handy chart featuring almost everything you need to make the best of YouTube in your teaching/learning experience. 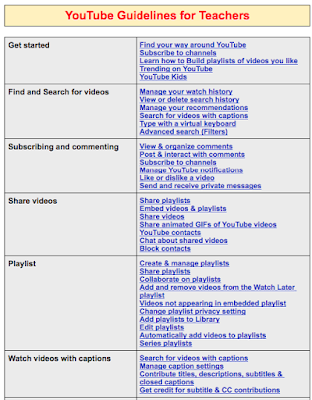 These are guidelines and tips curated from YouTube Help Centre to help you better understand how to use YouTube effectively. You may want to bookmark this page for later reference. Check out the chart and share with us your feedback in our Facebook page.